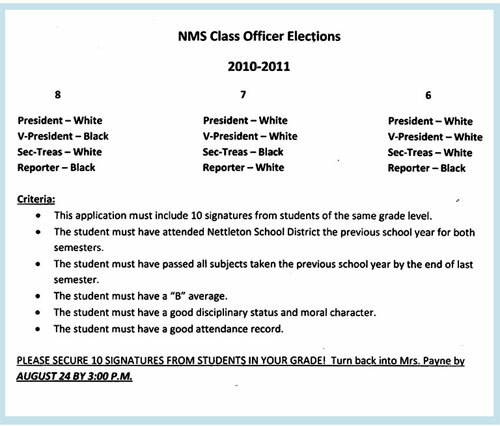 In a horrible narrative straight out of Jim Crow era America, a Mississippi public school has segregated student government elections. A memo passed out to 6th, 7th and 8th grade students stated essentially that out of 12 offices available for students to fill, 8 of those offices are for whites, while 4 have been deemed black seats. As you can see by the chart attached to this post all of the higher seats have been set aside only for the white students. Now maybe it's me. Maybe my history is a bit hazy, but I thought we were living in a post racial America? With the election of the nations first black President and angry whites devoting their hate in recent weeks more towards Islamic America, then African Americans, I must say that I was both surprised and completely appalled to read this in the news today. What's worse is that the School's African American principle has not commented. Hmmm, excuse me Ms. African American principle, but doesn't a segregated school election, with all of the higher positions only available to white students seem a bit WRONG??? There are a millions reasons why this is wrong, but fortunately I don't think I have to explain any of them to you, as this ignorance stands on it's own merit. The Mississippi Public School System should be ashamed of themselves for allowing something like this to go on. Although it is no secret that the state of Mississippi has had it's share of recent blunders, all rooted in racism, this is a fail of epic proportions. The Urban Politico will be keeping a close eye on this developing story and will let you know if any action is required by our readers in the way of DEMANDING equal treatment and opportunities for ALL students.